The lion’s share of the group’s estimated capital expenditure for FY2019 will go to Canal Walk in the Western Cape, where, seizing the opportunity to sail the rising international “foodie” wave, Hyprop will spend c.R58 million to revamp the food court and its outside areas. The development will also allow for the inclusion of a new attraction -The Ratanga Family Entertainment Centre – which will revive certain of the former successful Ratanga Junction amusement exhibits while in addition introducing new world-class rides. Prior to the development, Hyprop’s local portfolio is valued at R29.3 billion (December 2018). Hyprop CEO, Morné Wilken, says that although domestic trading conditions are still not optimal – with reducing consumer spend and increasing uncertainty ahead of the upcoming national elections – “identified capital projects nonetheless require investment from Hyprop in order to keep the South Africa portfolio relevant”. He says that maintaining Hyprop centres in line with global trends is a key focus of the new executive team at Hyprop. “The revamp and expansion will not only enable Canal Walk to attract the entire range of gourmets from ‘quick-and-easy’ to connoisseur, but is in-keeping with the family-oriented nature of Canal Walk by providing children’s entertainment in close proximity to the eating area,” he says. He adds that: “the development speaks to the fact that malls in South Africa remain key destinations for retail and family entertainment, making this a worthwhile investment over the long term”. 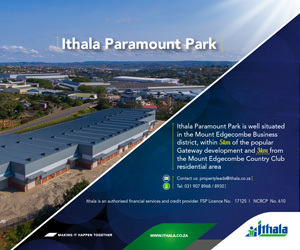 The Ratanga Family Entertainment Centre is expected to open before end-2019, while the food court upgrade will kick-off in the first quarter of 2020. He concludes that Hyprop will continue keeping a close watch on other global retail and consumer trends, including online shopping, to ensure that the group’s portfolio remains ahead of the curve. In interim results announced on 1 March, Hyprop delivered 8,8% growth in distributable income from the South African portfolio, which helped grow group-wide distributable income by 6%. The results reflected that despite tough times for retailers, Hyprop continues to enjoy unabated demand for space at its local malls - with vacancies down to 1.6% from 1.9% six months ago and over half the floorspace under leases expiring in 2019 already renewed at a healthy average rental escalation rate of 7.3%.